August 26, 2012. Though dwarfed by 100,000 acre+ Idaho fires, this has potential to grow. Started by lightning on the Park’s Central Plateau, it has now grown to about 1000 acres (1 1/2 square miles). 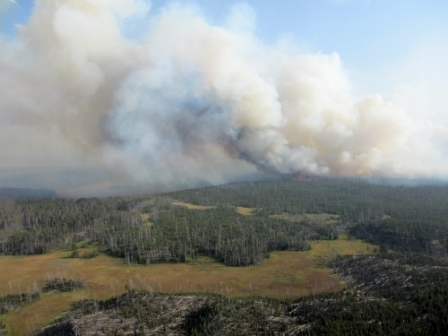 The fire is in the backcountry about 3-4 miles south of Virginia Cascades and is sometimes causing smoky conditions over the Norris to Canyon road. This is in a little used (by humans) area of rolling to flat topography with a lot of forested terrain. Although the grandaddy of all fires was in Yellowstone Park and outside its boundaries in 1988, it does have some moderately large fires (2000 – 5000 acres) every 4-5 years. In 1988 over a million acres of the 2.2 million acre park burned. Regeneration has been excellent. 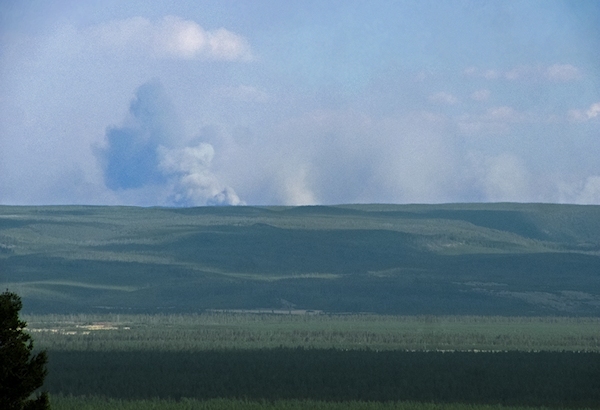 As elsewhere conditions for fires are now extreme in the Park. Update Sept. 14. The Cygnet Fire has grown to just short of 4000 acres. However, it has stalled out for the time being — no growth the last several days. This coming Saturday, 9/15, has predictions of low humidity and perhaps strong winds that could stir things up. It is beginning to get below freezing most nights now and they are longer. This gives the fuel less time to dry out and to burn hard during the sunlight hours. As of 10 AM Sunday rains have not developed. Chance of T-storms is 30%. Here is an interesting map. It shows the perimeter of the Cygnet Fire when it was 2800 acres, but perhaps more interesting is the map shows the location of old forest fires in the Park by date . . . a fascinating fire history as well as a guide to places where the Cygnet Fire is unlikely to burn (due to lack of fuel). It was pretty windy most of the afternoon today, I guess it goes without saying that a fire up on a plateau at about 8,000 feet would pick up under those conditions. It was also pretty warm out, not good for those fighting fires. I’ve been watching weather.com like crazy. The area is getting rain right now, thank god…from the plateau to Big Timber. Now if only Idaho would get some rain. Air quality was labeled as “poor” and in several cases as “dangerous” across Montana on the 15th, almost all due to the Idaho fires. What rain! Visibility is approximately 1 mile and the mountains have disappeared in the haze. It is very unhealthy at the moment. That’s what I was thinking when I read that. What rain? The smoke doesn’t even show on the Wunderground map but I can’t see further than about 1500ft. The smoke is really heavy (looks like a blackout on the map) north of Bozeman so I can imagine it’s not a good day to go jogging in that neck o’ the woods. A very orange sunrise today… can’t open the windows unless I want haze inside my place, right now it’s more like an encapsulated refuge in here! That’s exactly why I’m not out there yet. There’s no going “indoors” for me. Tent only. Well if that is the case, hopefully we will be dealing with smoke until the season is over and the snow is to deep for ya! I’ll still be coming through, no matter what. I’ve got a one week appointment with the section of Olympic National Park on the Pacific. Have fun in the Olympics Mike, one of my favorite places in the world, if you really want to see some beautiful country, then drop down to the Columbia River Gorge, that is Gods Country. Try this interactive mapping device, it may be more accurate than the choice you mentioned. You have to select what you want to see. We drove next to the Cygnet fire on Friday and saw the flames spreading next to the road. Smoke was brutal on my son with allergies. Also watched two grizzlies fighting over a bison carcass in Hayden Valley – quite a sight! Saturday we could see the fire clouds surging from the Southfork area – assuming it was from Cygnet. I did an update this morning. Thank you for your comments. After a week of mild haze here in Pocatello, it is a beautiful day with scattered clouds and fine air quality. Those smoke plumes can certainly ruin the day. I just spoke to a friend, a few minutes ago, who said that there were dry lightning strikes out near Two Top around midnight last night. Ugh. Bet there’s new fire(s) from that. I know it would be a little early (for here) for it to snow but they’ve already had snow in Colorado this past week. It’s certainly what could be really helpful here, or a big deluge of rain. Either way, this could go on for some time, even though it now freezes at night. The lack of rain has been ridiculous. I’ve pushed my trip back to early October, and even then I have no idea if smoke conditions will improve. But it does look like Yellowstone, and the country west of it has been getting a bit of rain. I’m also seeing ice/snow in the Beartooths and Bighorns. You bring those bolt cutters, the trapping for fur and predators will start in October. You could also help out Montana Footloose with some classes on how to remove pets from traps with bolt cutters. Personally I would love to see you stay until wolf trapping and see you cut one free. Don’t forget your camp stove, no open flame fire restrictions. Not unlike cutting deer, elk and pronghorn free from some of the hundreds of thousands of fencelines …. right Bob? I have about 15 miles of fence and in 18 years I have never found or seen a animal caught in my fence. I know fences are a favorite subject of yours, but if Mike knew anything about traps he would know bolt cutters have little to no value in freeing a animal from a trap. It’s his battle cry so I mock him. To cut a cable snare, you don’t need massive bolt cutters, but you do need something that will cut pretty stout wire. Knipex makes some very nice little nippers they call “mini bolt cutters,” for about $40. I have a pair of these for building/repairing high-tensile fence. They will also cut through a fence staple or #9 wire, so I’m pretty sure they’ll cut just about any snare cable. For something more versatile for around the same price, I also recommend high-quality side-cutting pliers. Spend the extra $10 to get high quality ones. I have a pair of these on my saddle — the first time I tried to cut a live deer out of a fence with the conventional fence tool, I found it way too slow. So I got these — you can cut in a hurry with them. These would also make quick work of a snare. REMEMBER: get Klein or Knipex brand, not some off brand junk made from inferior steel. No rain here in western Oregon since early July. Over two months of no rain; the native ash, maples, willows, hawthorn, cottonwoods, and alder trees are dropping their withered leaves. It has been dry in past years; but this time it is more extreme. Just got back from 6 days in Yellowstone and yes it was very smokey! I can’t believe 6 trips into the Lamar Valley and never saw a single elk. Saw a Wolf by pebble creek lots of Buffalo,Pronghorn,Big horn, Mountain Goat, Grizzly, fox and Coyote. In 35 years of going to Yellowstone every year I’ve never not seen Elk in the Lamar… how sad! It was a really cool site to see a Wolf and a Grizz eating a Buffalo side by side off the Yellowstone river, never seen that before. Watched them for a couple hours through the spotting scope. The wolf and griz interaction would have been really cool to see. I haven’t been in the park since early June, might get to go before the winter closing but not holding my breath… gas is 1/10 of a cent below $4 a gallon in the area right now. I wish they were closer so I could have taken pics! They were laying side by side eating no fighting.The Grizz was a good size Bear 3 or 4 years old and and the Wolf was a Big Grey. People said the day before there were 2 grizz feeding on it. Yeah gas is about 3.89 in West yellowstone 4.09 in Mammoth we spent at least $400.00 in gas for 6 days. I really went up to see the Elk Rut and was very dissapointed, they are not anywhere. A few here and there but not in there normal places. We were also surprised not to see any elk in the park. Also, no elk at Mammoth – very unusual. I hope they are just up in the high country since it has been so warm. I’m going the first weekend of Oct., and have an update. You’ll probably see plenty of them in October. The upper elevations are still the only places where there’s likely to be any forage for them. Everything below 7500ft is burnt to a crisp, has been most of the summer. There still won’t be much for them when they do come down lower. Just returned, saw a lot of elk, several hugh bulls. Mostly in Lamar Valley and the Madison area. Gibbons Meadow as well. We saw 1 Bull and 2 cows the whole time in Mammoth. But there were a bunch in Gardiner feeding on the grass across from Best Western. We even did the Balcktail loop every day and never seen anything. Very weird! Climate change and maybe just fewer elk, but I’m guessing. I’ve never seen enough Park elk to bother about in mid-September, except at Mammoth. This summer has been astonishingly dry, however, and the forecast is for more of the same. Thunderstorms, however, are more difficult than other weather changes to forecast beyond 4-5 days in the future. I never seen the park like this. Dry creeks, river levels very low, just a trickle in some areas. It needs lots of snow this year. You just described my area here in southwest Montana to a “t” Timz. The only real moisture, in quite awhile, has been from a handful of hard frosts. Had a bit of fall color, maybe a week? And then the cold zapped the trees (6 degrees Saturday morning) turning the leaves an ugly brown. Its been so dry here, elk are starting to migrate out of the area early. I’ve come across 3 groups trying to navigate the fences and highway in the last week and I don’t usually see them moving out til November. Also noticed ranchers in my area have changed tactics this fall as they bring their cattle down off public lands. The “round em up, head em out(Rawhide theme?) sort em out and then push em back to the ranch” approach, with lots of riders on hand to keep them moving, has been replaced with stringing them out along the road, with no real supervision, guessing to take advantage of the “free” grass along the roadsides on their way home. Black cows, on a dark highway at night?……recipe for disaster. Significant rainfall this evening in the area! Could squelch the Cygnet fire or diminish it considerably. And maybe some other fires along the way. And according to weather.com, these rain clouds are on their way to Salmon, ID, and westward. For the most part they are trending eastward and somewhat north. It looks like the divide is getting a good amount but it may not be that much in the Mustang Complex area. The Snake River Plain appears to be getting the most, but they need it too since the Treasure Valley (Twin Falls) area has been burning all summer too. Along the easternmost stretch of the divide between Idaho and Montana has been getting light to moderate rain most of the evening, still coming down presently. the best things that’s happened in weeks around here. My lungs are feeling better than they have in quite some time now that there’s more air than stale smoke to breathe. The good thing about this being sustained is that it may well be of benefit to those working on the fires over in Wyoming (Jackson Area) and maybe as far as that big fire area near Sheridan area too.